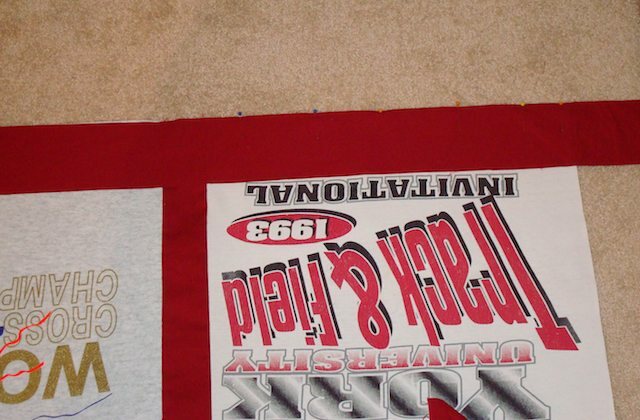 Some had asked for a tutorial of how I made TJ's t-shirt quilt. I am sure there are better tutorials and even methods around, but here is how I did mine. I apologize for the quality of some of the pictures - my studio is in my currently unfinished basement so the lighting and flooring is not the greatest. 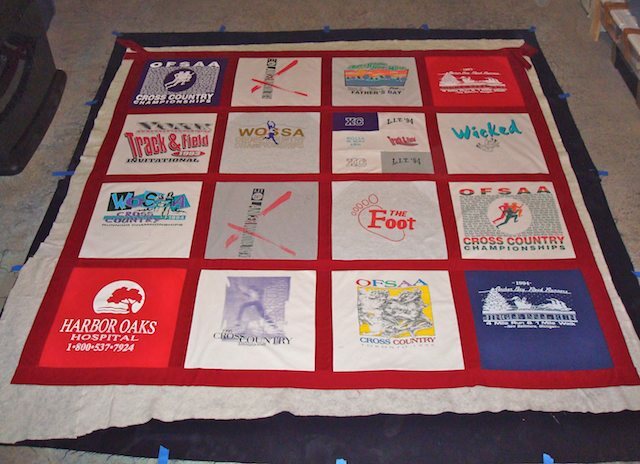 First, pick out all the t-shirts that you wish to use for the quilt and do a rough layout on the floor. Don't worry too much about the condition of the shirts as holes can be fixed. As you can see, some of these ones were pretty bad. Determine which shirt has the largest logo. This will be the size of your squares. 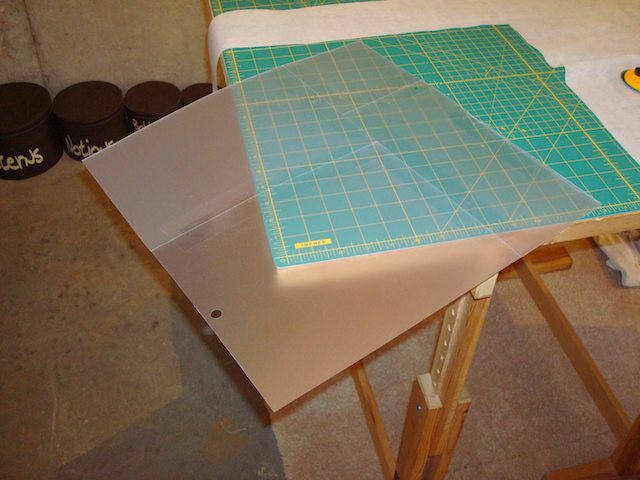 Create a template for cutting out your pieces out of template plastic. Make sure that you leave a seam allowance as well. 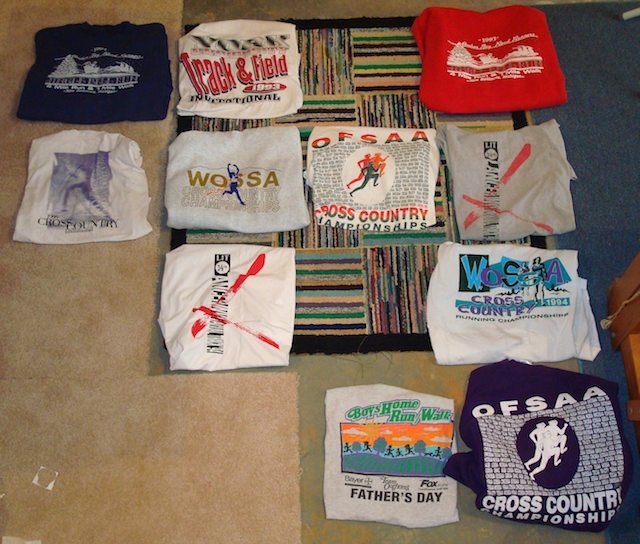 In this case I used a 1/2 inch allowance because I didn't want to be too close to the edge of the weak shirts. 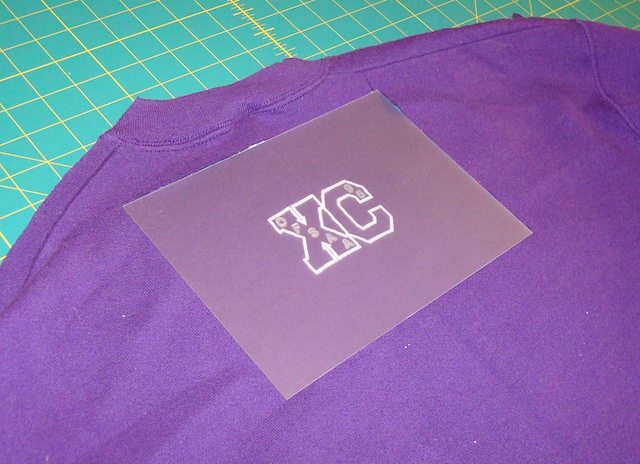 Cut out matching squares of fusible interfacing for any t-shirts that are really thin or have any holes in them. 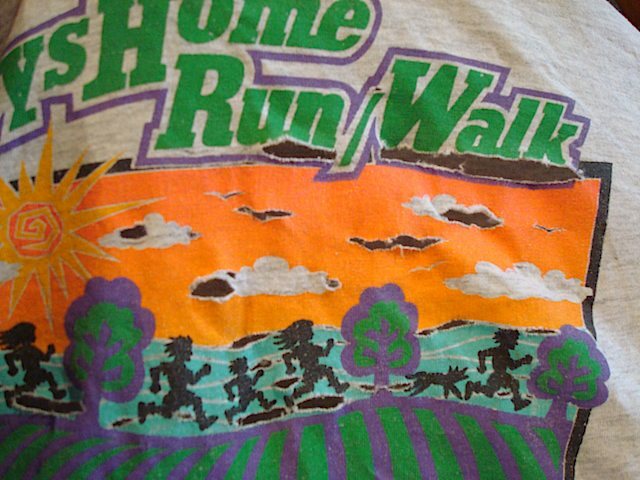 I used reasonably thick stuff because the shirts were pretty worn. 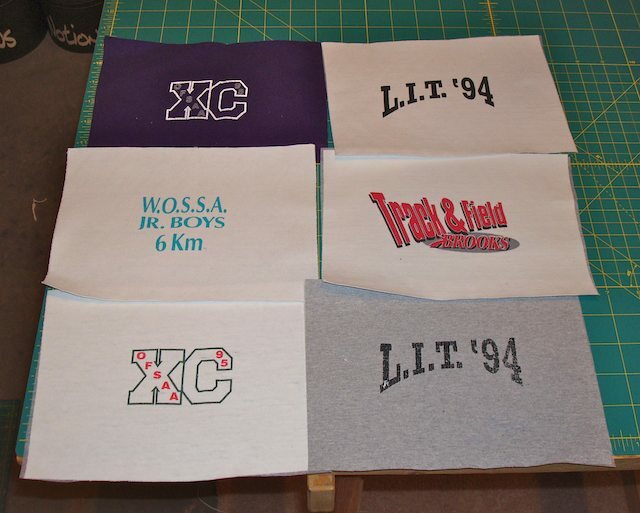 Iron on the squares before you cut out the logos on these shirts (make sure that any holes in the shirt line up before you press the interfacing. This will keep them from getting any bigger). Make sure to follow the directions for your specific interfacing. Cut out all the squares for the quilt using the template, a rotary cutter and self healing mat. You can do it with scissors if you are really careful and measure well, but it will save you a lot of time with the template. Remember to cut the back off the shirt first if there is anything back there you want to use. Otherwise you will cut through it with the rotary cutter. 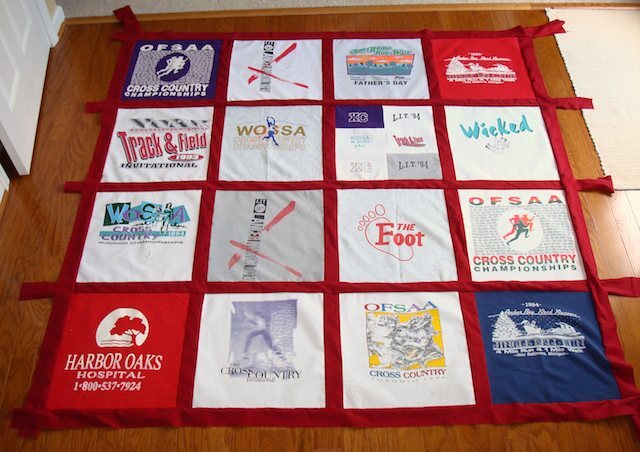 If you are making one of these pieced squares, go ahead and sew it together now. Once you have all the squares lined and cut out, do another layout to make sure that you are happy with it. The next step is to cut out the pieces that go between the shirts, the borders if you will. In my case I picked out a nice deep red because there was a lot of red accents in the shirt, and also because it is one of TJ's favourite colours. 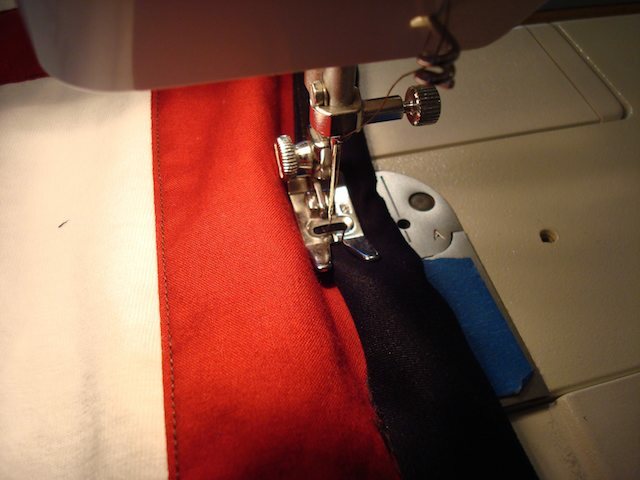 Decide how wide you want the strips to be, add your seam allowance and begin cutting out the strips. In the vertical direction you will be cutting short strips to piece together one row of shirts. 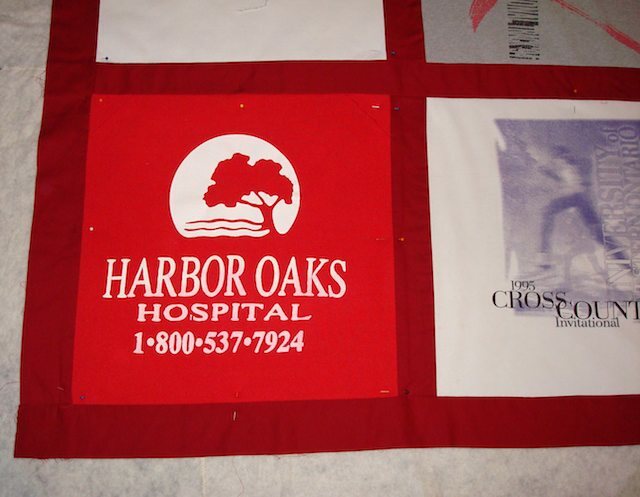 In the horizontal direction you want strips that are the full width of the quilt. 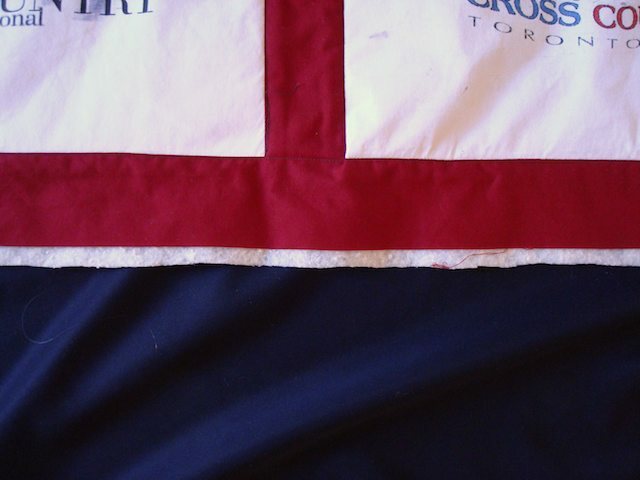 Pin carefully and sew these borders into position, vertical piece first, then horizontal. You can also add the same colour strips around the outside for a nice neat frame. Once finished these steps, your quilt should look like this. The next step is backing and batting. Lay out your backing fabric (in this case dark blue) on the floor and tape it out so that it is taut. Flat sheets work great for a backing fabric because they are large enough not to need to seam anywhere. 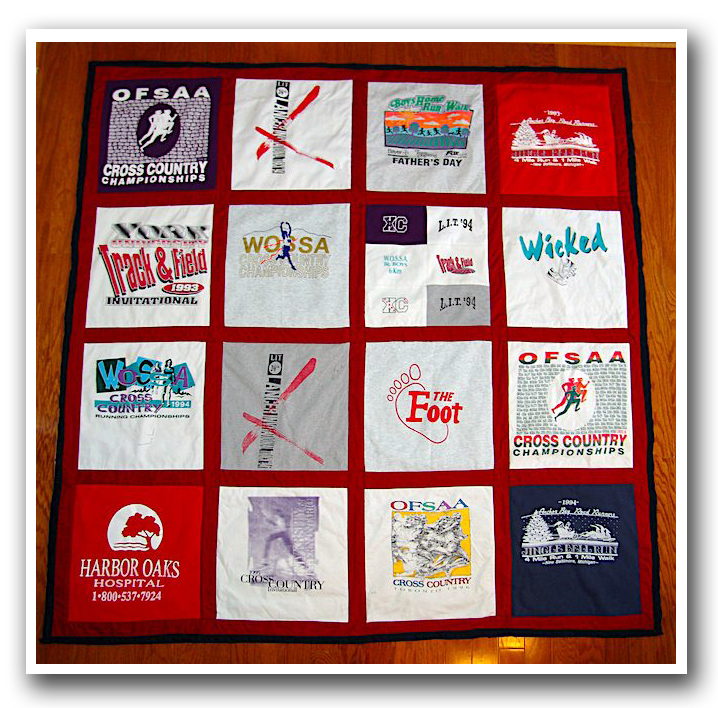 In my case I used two pieces which I sewed together into a large square. 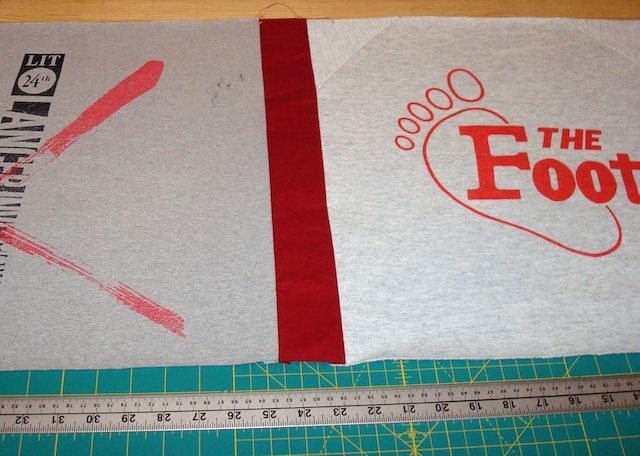 Once you have laid out your backing fabric, spray with temporary fabric adhesive. This step is not absolutely necessary, but it will save you a ton of pinning and basting and will keep you from wanting to rip out your hair when the thing shifts while you are trying to quilt it. This stuff washes out easily once the quilt is finished. 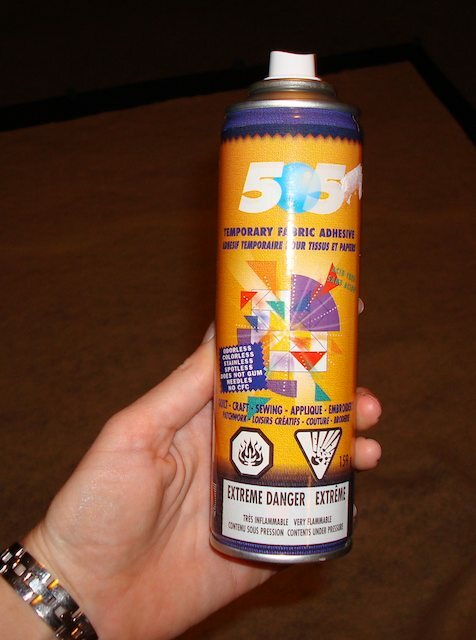 Once you have sprayed the adhesive, lay down your batting. The thinner the batting you use, the easier it will be to quilt. I recommend cotton batting as it is easier to care for and gives the quilt a more natural feel. If you want your quilt to have the sort of wrinkly traditional quilt look, don't pre-wash the batting. If you want your quilt to be really flat, pre-wash the batting so it is already shrunken down to it's finished size. Once you have laid out the batting and smoothed it, spray it with more adhesive. Then lay down your quilt top. Now, here is the most important and time consuming step of the process. Smoothing and pinning. Start from the middle and PIN PIN PIN. You will need many many pins for this step. The more time you spend pinning, the easier and better the quilting will be. Trust me. Please. Smooth and pin, smooth and pin. Repeat after me. Smooth and pin. Now you can finally move on to the quilting. I just "stitched the ditch" which means sewing along the seams between the t-shirts and the borders. 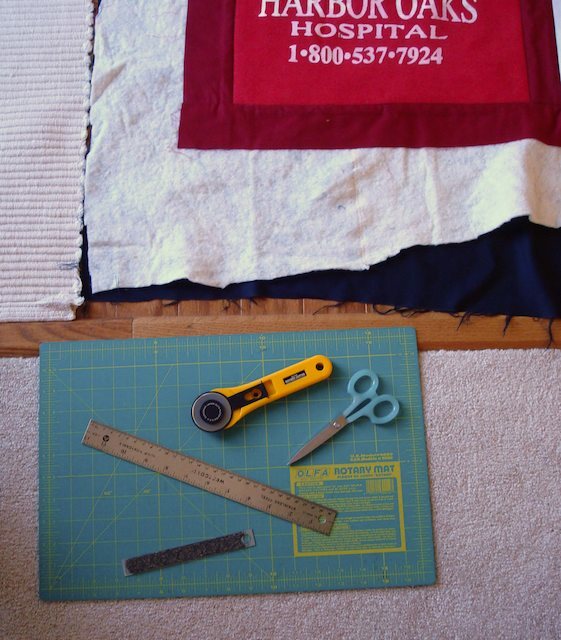 There are many other quilting methods, including sending the quilt top out to someone to quilt it, but this method works best for the shirt quilts I think. Start from the middle seams in the quilt and move to the outside. I roll the quilt up under the machine to make it easier. You will stab yourself with pins during this process, so just be careful and aware. 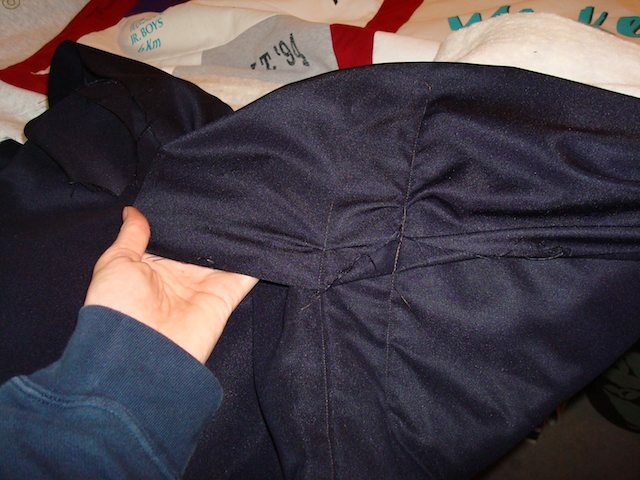 Don't stress to much if you make a mistake, like sewing the edge of the backing into a seam. Stitch rippers are your friend. Once you have quilted all the seams, lay the quilt out to make sure you are happy with it. Make sure that you have taken all the pins out at this point. Now it is time to trim the batting (and only the batting right now). 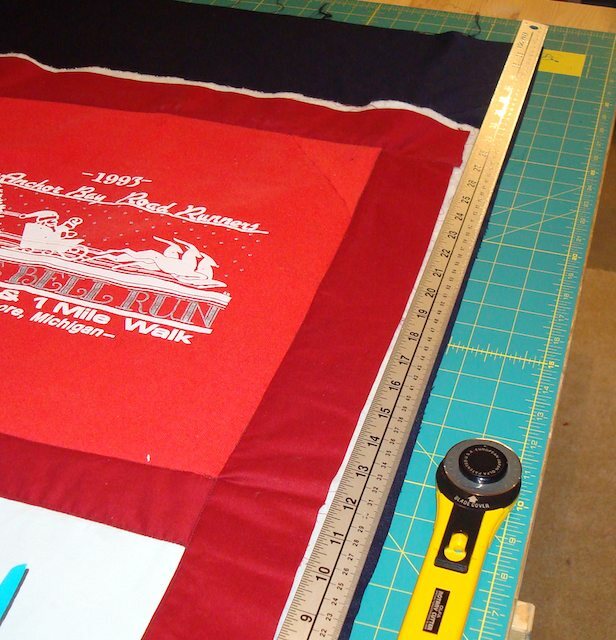 I use the rotary cutter, mat and a ruler to trim down the batting to just past the border fabric (make sure that you do not cut the backing at this point!). Once the batting is done it is time to trim the backing. I like to wrap my backing around and overlap the border fabric to close the quilt off. So leave yourself enough room to sew it down and create the edging. 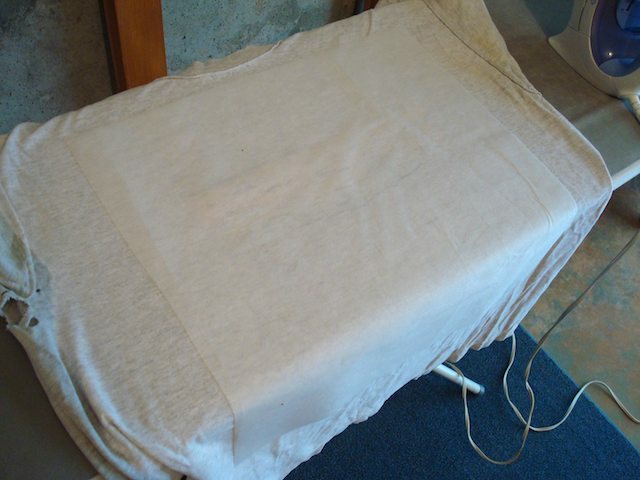 Carefully fold over the backing fabric and iron it down into the edging. Pin like crazy for this step as well. Then go ahead and sew down the edging. 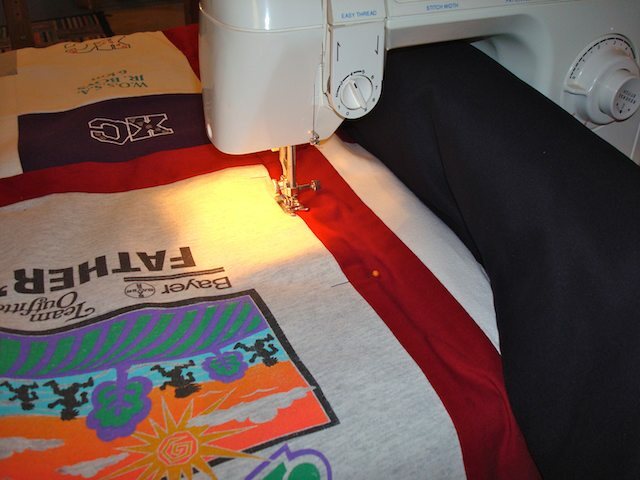 Once you are finished the machine sewing, there may be some hand sewing to do. For my quilt I hand sewed the corners into a mitred edge (the same way you would wrap a present). I also am going to hand sew some of the larger holes in the t-shirts closed, even though they are on the interfacing. They could still catch on something and pull open, so the stitching will just prevent anything catastrophic. Et voila! You are finished! This is by no means a comprehensive tutorial on quilting. I highly recommend this book if you are a beginner or new quilter. I use it all the time as a reference (I have the first edition, but I am sure the second is even better). It gives good detailed instructions for all the basics of quilting. 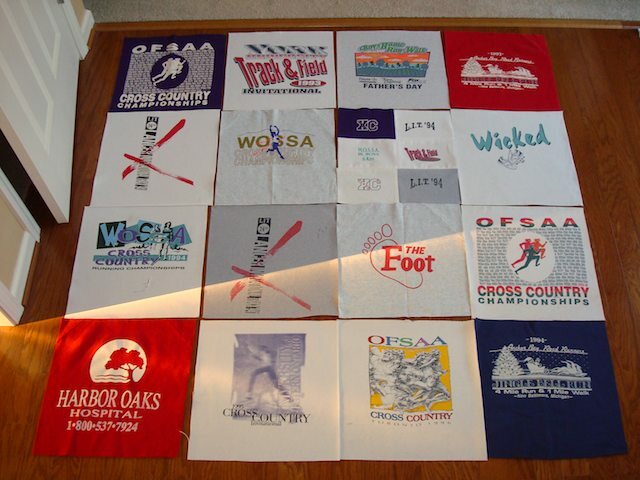 I hope you enjoy working on your first t-shirt quilt!